Less than a year after a similar effort fell through, new plans have been submitted to State College Borough to convert the 86-year-old Glennland Building into a boutique hotel. According to the development plans, Scholar Hotel Group proposes making the apartment and office building at 205 E. Beaver Ave. a 72-room hotel. Scholar Hotel Group is a subsidiary of Ardmore-based Real Estate Capital Management LLC, which developed the Fraser Centre in State College. One other Scholar Hotel is located in Morgantown, W.Va., and according to the company website it is specializing in hotels in university towns. The plans call for 18 rooms each on the second through fifth floors of the existing Glennland Building. The first floor would have a lobby, conference center, fitness center and a small bistro. The basement would house offices as well as laundry, housekeeping and mechanical spaces. A small house, currently used for apartments, on the parcel at the corner of McAllister Alley would be demolished and replaced with a drop-off area for hotel guests. The property is currently "nonconforming" for required parking, with 69 spaces required but 13 provided. Under the hotel plans, fewer spaces would be required at 57 and no new parking is proposed. Earlier discussions about converting the building suggested municipal parking garages would serve as hotel parking. According to the Real Estate Capital Management website, Scholar Hotels will feature a design themed around the university near where they are located. State College Planning Commission will review the plans at its meeting on Wednesday and decide whether or not to recommend approval. Glennland Building owners have been looking to sell the property for several years. In 2017, co-owner Nancy Campbell Slagle said that her family had made significant investments to maintain the building over the years, but found the costs to fend off further deterioration and, ultimately, obsolescence would be prohibitive. 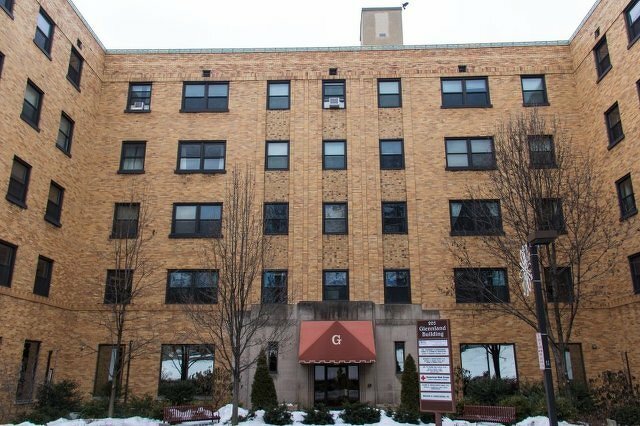 The family had recently spent $1 million on electrical and heating systems, but repairs were needed for the building's exterior, retaining walls, elevator service and air conditioning. Listed in the National Register of Historic places, the building currently rents apartments to graduate and undergraduate students and office space to commercial and professional tenants. In the spring of 2018, tenants were notified their leases would not be renewed and the Campbells informed the borough that they had lined up an unidentified buyer who would convert it into a boutique hotel. No development plans were submitted to the borough at the time, and in June 2018, co-owner Richard L. Campbell said the prospective buyer decided not to go through with the purchase, citing renovation costs. Tenants were then notified they could renew their leases. "We were told that the cost of necessary renovations were substantially higher than anticipated given the condition and age of the building," Campbell said last June. Constructed in 1933 by builder O.W. Houts and physician Dr. Grover Glenn, the Glennland has been owned by the Campbell family since a few years after it opened, first by Judge R. Paul Campbell, who passed it down to his children and grandchildren. The Glennland has been a history-making building over its 86 years. For 40 years it was the tallest building in State College and was home to the area's first public elevator and first indoor swimming pool. The pool closed in 1967, but the colorful mosaic tiles remain to brighten offices and serve as a reminder of the building's history. Richard Campbell, Robert Campbell and Nancy Slagle are listed as the building's owners of record and Scholar State College LLC is listed as developer/equitable owner on the development plans. Scholar would be the second hotelier specializing in college town properties to move into State College. Chicago-based real estate company AJ Capital Ventures acquired the Atherton Hotel in 2018 and announced plans to rebrand it as Graduate State College -- part of the company's Graduate Hotels collection -- when renovations are completed this fall. 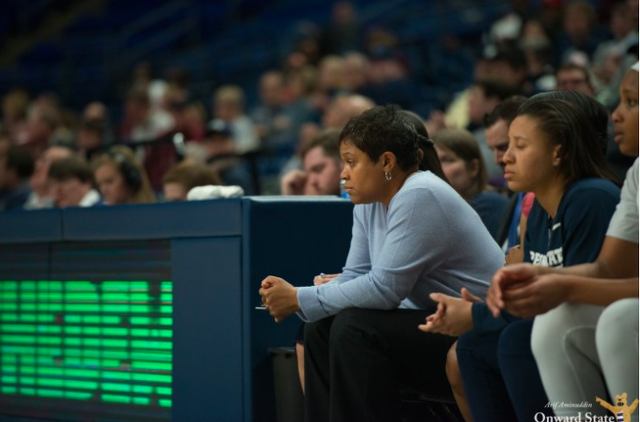 Penn State women's basketball will have a new coach for the 2019-20 season and beyond as the program officially parted ways with longtime coach Coquese Washington on Friday.